Your donation benefits real people, on a personal level. When you make a donation to Alivio Medical Center, you are doing more than just giving to our medical clinic. You are providing opportunities and promoting solutions for thousands of unborn babies, children, women, men and seniors across Alivio’s eleven targeted communities. You are giving to the woman in Pilsen who is struggling with domestic violence; the grandfather in South Lawndale who is newly diagnosed with type two diabetes; and the young girl in Back of the Yards who suffers from obesity and asthma. You are giving to support the provision of all services with sensitivity and compassion. 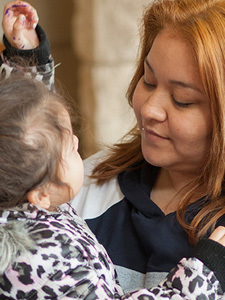 You are giving to assure that Alivio Medical Center is able to render quality health care that is free of all cultural, linguistic and financial barriers. Alivio is also registered to AmazonSmile, where Amazon donates 0.5% of the price of eligible smile.amazon.com purchases to the charities selected by customers. Please click here for Alivio's unique charity link. Note: Alivio Medical Center currently uses Gesture / Givesmart to accept donations. This service is safe and convenient to use and all donations are tax-deductable. The first time you contribute you will need to create an account. In follow up visits, you'll only need to login.